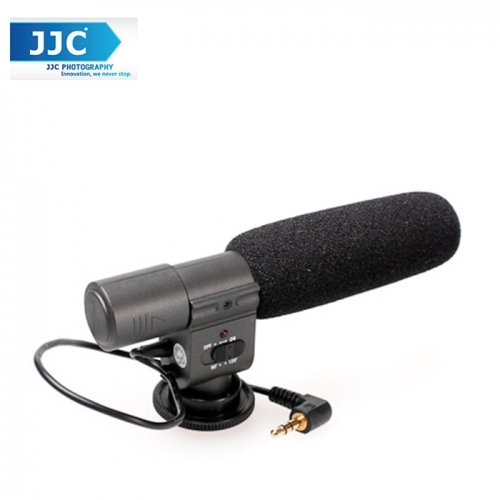 Stereo Microphone for high-quality sound pick-up MIC-1 stereo microphone helps you to enhance sound quality when taking videos with DSLR cameras or camcorders. It enables natural, clear sound pick-up with superb clarity and provides low voltage alarm indication, wide frequency, strong direction as well as long distance sound pick-up. The microphone can be fixed on the DV or DSLR with microphone hold and path. The MIC-1 enables a natural sound pick-up. Delivering a stereo sound image with superb clarity. The pick up pattern (affecting the sound stage width) can be set to 90° or 120° according to the sound source. The microphone is sensitive, don't drop it, or shake it. Keep it away from high temperature and humidity, especially more than 60°C. It is put near the amplifier, the feedback will happen. If this happens, please put the microphone in the position far from the amplifier or turn down the volume of the amplifier. If you change the setting of mode when you take the record, noise will occur. If the windscreen catches the rain, it should be dried in the dry and cool place, not under the strong sunshine, to avoid aging.